This carefully selected walk covers all the most important sights of Prague, and seeing it with a great guide is like having the past suddenly rise to the surface. 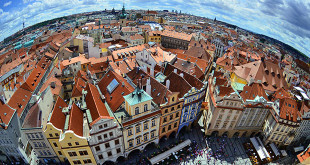 We stroll around the famous historical Prague quarters – Old Town, Jewish Quarter, Lesser Town and Prague Castle. The first part starts on the Old Town Square with a general introduction to Prague. Admiring the impressive composition of old buildings and churches, we also become acquainted with the life of the Czech reformer John Huss. Crooked lanes lead us back around other keyholes into Prague’s past: Mozart‘s Don Giovanni in the Estates Theatre, Karolinum – the Charles University since 1348, the cubist house of the Black Madonnathe and the medieval courtyard Ungelt. If there’s time we also visit the Powder Gate and the majestic baroque building of Municipal House. A visit to the Jewish Quarter leads us back to its tragic history. You discover the destiny of Prague Jews living behind the wall of the former ghetto. The Old-New Synagogue, the Old Jewish Cemetery, the Jewish Museum … visit with us the places where the fabulous Golem was created, and follow with us in the footsteps of the famous Jewish writer Franz Kafka. After this, we walk to the Marianske Square, where you have a 30-minute break from 12:45 till 13.15. At this stage you can decide whether you wish to continue after the break, or if you prefer you can come another day for the second part of the tour. Our starting point for the second part is the beautiful baroque library of Klementinum. Crossing the Charles Bridge, the real “open gallery under the sky”, we admire the peaceful tiny Kampa Island, followed by the graffiti on Lennon Wall. Finally we reach the Lesser Town Square, the highlight of which is the great St. Nicholas Church. After a relaxing visit to the great St. Nicholas Church, we climb 200 steps leading to the Hradcanske Square. Here we reach Prague Castle, one of the biggest fortresses in Europe. This “city within the city” hides the Schwarzenberg Palace, Archbishop’s Palace, Old Royal Palace, the Basilica of St. George … and the greatest architectural treasure – St. Vitus Cathedral. The walk finishes next to the Old Royal Palace with a charming view of Prague, the city of a hundred spires. It is really easy to walk, simple to understand and great to enjoy! Daily at 11:00 am, only in English. How can I claim this free tour offer? When using transfer from Prague Airport or Prague train station, PAT chauffeur will automatically give you a ’transport voucher’. All you need to do is to bring your voucher and show it to our tour guide. No, just turn up 10 minutes before the tour starts. It finishes at Prague Castle. Tour guide will gladly navigate you back to the centrum or another place you might wish to go. 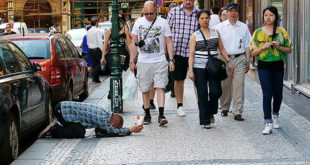 I have seen other free walking tours in Prague. What is the difference between your complimentary tour and other companies offering free tours? All other free tours are run by volunteers who work only for their tips. That means that tour is tips-based. Our tours are run by paid tour guides and tips are not required. Please note that some tour operators of those free tours will provide the first part of the tour for free and the second for an extra charge (at the end of the first part you might be offered to continue your tour to the Castle, but only if you choose to pay). Thank you for the info provided. We are new in Europe. We will be going Prague tomorrow. We are interested in the walking tour. We understand that it is free and is tips based. However I am not sure how much is considered a reasonable tip for a good tour. I don not wish to offend the guide and at the same time, I am concerned about getting misled. 4 of us did the Prague walking tour with Jeremy. Planned to stop at lunchtime but it was so good we stayed to the bitter (the weather was bitter, not Jeremy- end. He was not only entertaining but very interesting. Mainly because he was so clearly interested in his subject. Without doubt the highlight of the holiday. Cannot recommend too highly. I’m visiting Prague at the beginning of April with my husband and am very much looking forward to it. I’m really interested in your walking tour, however, we are transferred to our hotel by our holiday tour company. Can I still get a voucher for the walking tour from somewhere? You can take advantage of free walking tour once you get the voucher. If your holiday tour company has an arrangement with Prague Airport Transfers then you will receive a voucher from their driver. Otherwise you will have to book some other paid tour. There are also other free tour guide providers but they will ask you for a small contribution, so it’s not really free. Do you have tours on January 1st? Yes, tour is held daily, all year round. We are visiting Prague in March 2013. Our transfer from the airport is part of the holiday package. We would like to join the free walking tour. You would need a transport voucher to participate in this tour. If your holiday tour company has an arrangement with Prague Airport Transfers then you will receive a voucher from their driver. 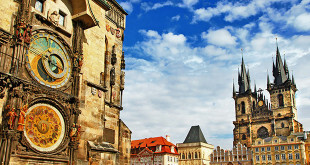 Alternatively you can contact Prague Airport Transfers or book the paid version of this tour – called the Superior Tour. We participated in this tour just last week. Luice, our tour guide, was briliiant, and made our visit even more memorable. Thanks. Is the tour available on a fee pay basis for those not utilising Prague Airport transfers as we arrive via train from Krakow and would be happy to pay the same commission/ fee paid by Prague Airport Transfers. Just arrived back from weekend in prague, just want to say what a great tour it was your tour guide Dana was very informative and very friendly. Also your transfers were very good on time and very friendly. Thank you. How do we get a coupon for the free tour if we are driving to Prague and staying in an apartment? Are there similar tours which one can pay for? Unfortunately this tour is only available if you have a voucher for this tour, which as mentioned is provided by the driver when using the Prague Airport Transfers company. In your case you would have to shop around and look for similar tours. Or just come to the Old Town Square where most tour guides gather, and pay on the spot. Can anyone help? My elderly grandparents are visiting Prague in September and this tour would be ideal for them, however, my Gran’ss mobility isn’t the greatest and i’m wondering if anyone knows how long this tour lasts and is there alot of up / down hill walking? We are going to Prague this week and would be interested in joining this guided tour in English. I understand it commences at 11am daily but where do we meet? I would appreciate your kind response as we are travelling in 2 days. Many thanks. Anybody who has used Prague Airport Transfers (or booked) service and holds a transport voucher can participate in this tour. 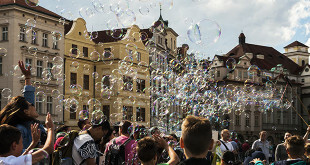 The tour starts from Old Town Square, where a guide will be waiting just next to the Cartier shop (next to the Czech Tourism office), holding a red umbrella with the Prague Airport Transfers logo. Where does this tour start from? Can anybody show up ten minutes prior to it starting, or do you need to use the transfer facility? The meeting point is next to the Old Town Square on the corrner of Parizska street, next to the Czech Tourism Office. You might ask at your hotel reception for exact directions. The Old Town Sq. is a 5-minute walk from Staromestska metro or tram station and is one of the most famous locations in Prague, so everyone knows it. Your guide will be waiting for you carrying a red umbrella. Yes, you need to use Prague Airport Transfers.